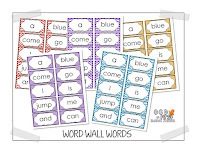 How do you guys practice word work in the classroom? 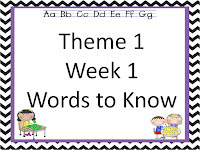 Do your kids go from week to week forgetting the words from the previous week? Do they say they are practicing at home, but you can tell that they haven't even looked at their words since you introduced them? Well, these were some of the issues we were having until we decided to incorporate our words throughout our day for an entire week. I KNOW - yes, I should have known to do that, but we have honestly never been trained on how to get children to LEARN high frequency words. We went over the words, practiced the words with flashcards throughout the day, BUT that wasn't enough. My strong kiddos were fine, but my struggling students had a really hard time keeping these words in their heads. So, two years ago, my first grade team decided to make our own curriculum with words that we felt students needed to know. We used both Fry and Dolch words, and put together some of the things we felt would help them retain the words. We introduce the words using Elkonin boxes and a baseball game. The students have their Elkonin box sheet in front of them, and we play Baseball with the words. The ppt walks you through the game. 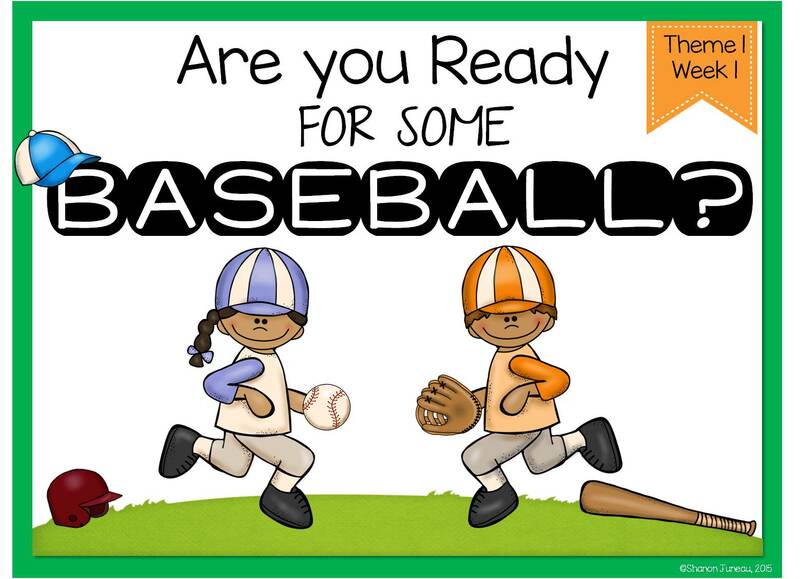 The kids chatter, "Hey Batter, Batter..." and then instead of saying SWING, you (the teacher) say the word. Once you say the word, you ask the students how many sounds they hear. Then the boxes appear to show how many sounds, and then the word appears per sound. Once you talk about the word, then the students write their word in the boxes. I usually have two students say a sentence with the word as they are writing it in their box. We do this for each word that we have for the week. We also have a ppt that we use throughout the day that reviews the words. Students need to say these words within 3 seconds by the end of the week, so we use our ppt daily for practice. Sometimes we call each table up to say a word before we can get water, other times it's just a 2-minute filler before we transition to another task. The powerpoint stays at the bottom of my screen for easy access. We also have two sheets that we place in the students' binders. These go home on Monday, and students practice the words and sentences nightly as part of their homework. Now, some do, and some don't. We include these sheets so that if a student is having trouble, we can refer to these during conferences. Here's one place where students get daily work with our words. FILL IN THE BLANK: We have pages that have the sentences that students need to practice with the word missing from the sentence. We have these sheets as fill in the blank with two words to choose from, or fill in the blank where they have a word box to choose from. 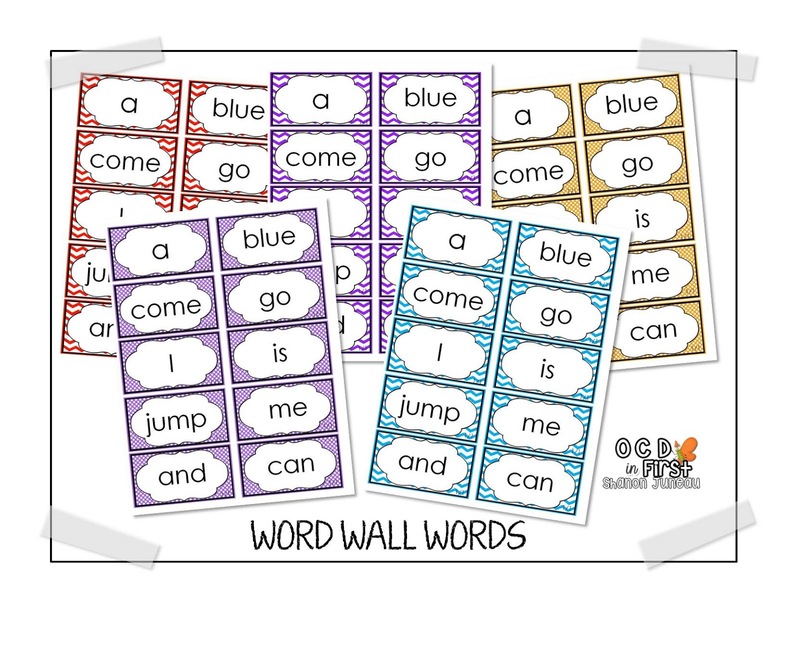 We usually start off with most of the class having two words, but gradually move to word boxes. 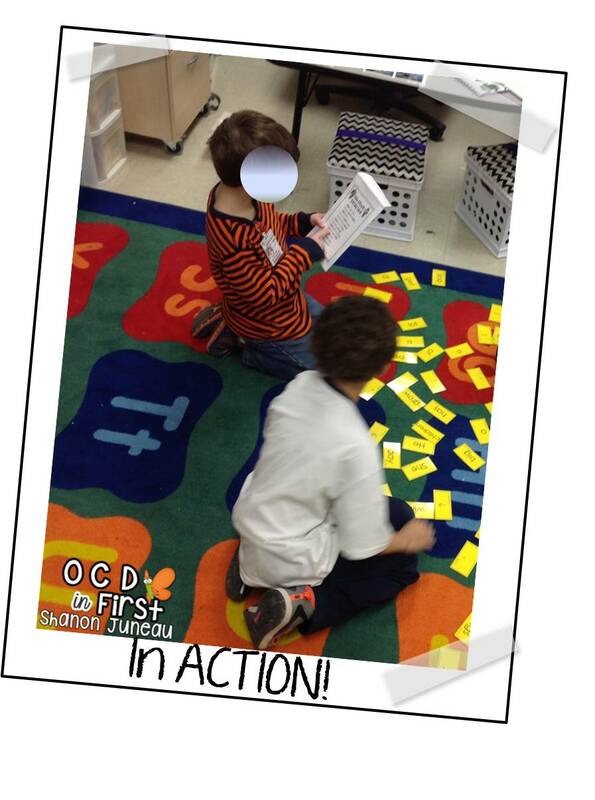 ADD AND SUBTRACT LETTERS: We have pages where students need to either add letters to make a new word, subtract letters to make a new word, or substitute letters to make a new word. ABC ORDER: We start off with only words with different first letters, and eventually move to second and third letter order. MIX IT UP: For our mix it up pages, students have to unscramble the words and then add them up. (The tiles are scrabble tiles, so they add up the points.) We have another one where they just have to unscramble using the word box. 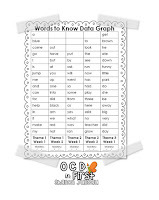 WORD SEARCH: We also have word searches for the words (a favorite of the kids). There are different levels of the word search. I let the kids pick which one they want. CUT AND PASTE: We have sheets where students have to cut out the words and then glue the words into the boxes to make one of our sentences that match our homework binder work. Another thing I found useful was making flashcards for students to grab anytime they have down time. We also grabbed these during centers to work with a partner. One person is the teacher and the other the student. The teacher has the timer, and the student tries to say the words as fast as they can. Students actually liked this center. I guess anytime you give them the role of teacher, they want to play. Student A: "Guess what I found out?" Student A: "These are the same sentences that are in my binder." Student A: "Yep, I'm going to tell Mrs. Juneau so she can tell the class!" OK - so this little center is one of my favorites. We were told years ago to have students write sentences and then cut them up and then put them back together. I loved that idea, but truth be told, it's not something I could get to on a daily basis in GR. This year, they cut our guided reading time, so this center really came in handy. This one takes a little bit of prep, but it is so worth it. I bought white envelopes (the smaller ones) and then taped the sentence sheet on top and laminated. All the cards go into this envelope. Students work in pairs (we have two per week and the borders are different so if they get mixed up, students know which envelope the word cards go in) Meaning, one group works with the curly border and the other group works with the square border. They race each other. BUT... it usually becomes pretty competitive since they are racing the other group, so usually they are both building the sentences and both reading the sentences. It's really cute to see how well they can SYNERGIZE! 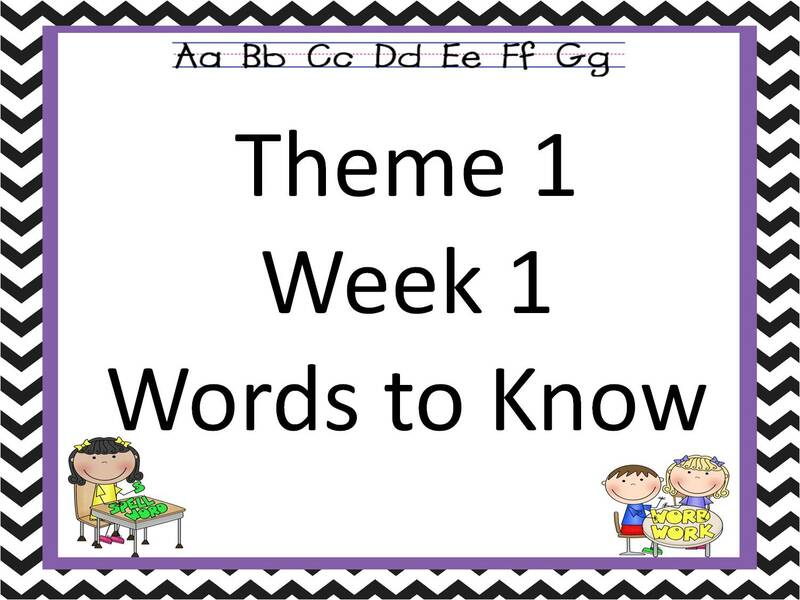 I also have included word wall cards that have all the words for the week. I have a few different colors and either chevron or polka dot background to pick from. I started off using these this year, but ended up changing my word wall completely. This worked for me last year, but for some reason I just couldn't get it together this year. Two of my co-workers did use this system, though, and loved it. We also have cards in a center that have all of the words for the month. 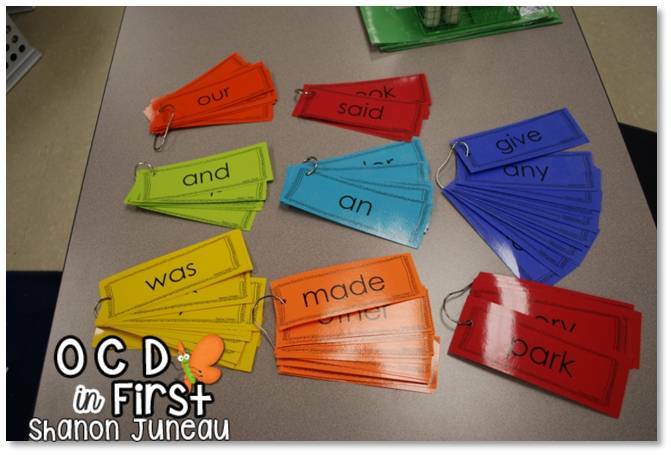 With these cards, students get the timer and time themselves saying the words. Students also have a booklet that they keep in their GR bag to track their score in words per minute (this can be done at home) If you do these at school, you will need a stopwatch. We didn't actually do these this year, because my students really retained the words, but last year I had a few that needed this extra practice. We are a Leader in Me school, so we also needed something for the students to track themselves. 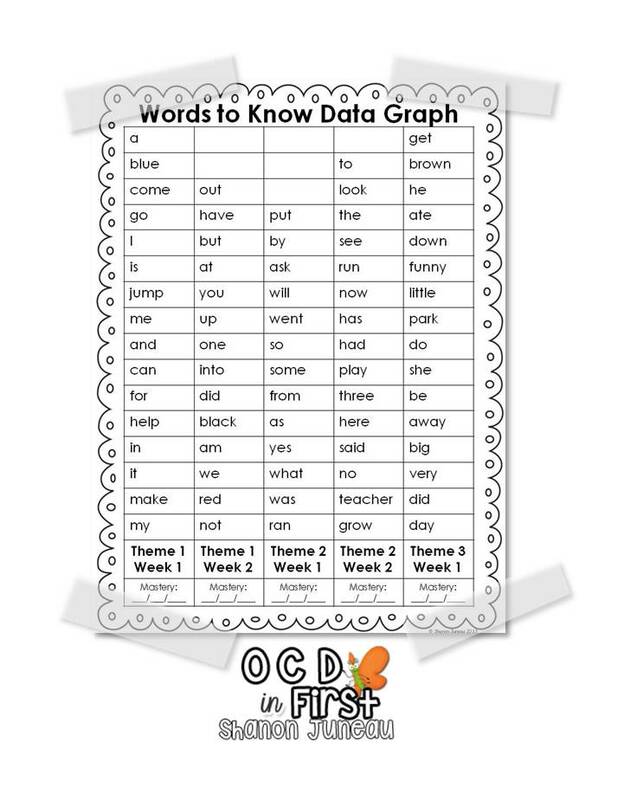 We use our Words to Know Data Graph for this. On Fridays, I call students up one at a time and they have to say the words within three seconds. If they miss a word or struggle with a word, I circle it in pencil. They color all the words not circled. They know they will have to practice a bit more, and the next week we try again. We use these graphs for our student-led conferences as well. The students can explain it beautifully! All of the above items are included in the weekly product. Here are some other items that we use in our classroom that I know have helped tremendously with building a foundation of word recognition. These games still use all the same words, but it's a month of words, rather than weekly words. So, once you have a month of words under your belt, then you introduce the first set of games. My students have created their own version of this game, and since this is our second year doing it, and both classes did exactly the same thing, I'm guessing other classes are doing this as well. They like to play in groups (usually 2-4 students). They "divy" up the cards evenly, then turn all the cards face up. One person starts the game, and then whoever has the next word, says it. Once you say that card, you turn it over. If you can get through the entire game, turning over the cards as you go, you win. But sometimes they get to a card that says who has (word) and no-one has it. Then they have to turn all the cards back over, look for that card, and start again. Someone obviously said the wrong word, so they have to start over. Once they realize that they can't just say words, or the game doesn't work, they pay much better attention to what they are reading. We also have a board game that practices our sentences. Each card has a fill the blank sentence (same as the homework and fluency sentences). Students have to pick the word that fits into the sentence. (multiple choice). There is an answer key for this one, so students say, "#7 is A (some say the word), and another student checks to make sure. Once the student gets the right answer, they spin and move around the board. OK - so here's a FAVORITE!! This is an adaptation of the Spot it games, but this one has words, and it happens to be the same words that they have been practicing throughout the weeks. 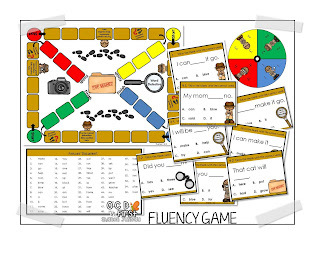 Once you have taught four weeks of words, you then introduce the new game. With this game, students put the stack of cards in the middle and each student takes one card. They then try to find their one match with the center card. Whoever says their match first, gets both cards, and then picks another card from the middle and starts again. I make my students prove it, though. When they say the word, they also have to point to the match. I had one little man last year who would just say words and always win. One day I observed him, and was amazed at how fast he was. Yep, I'm clueless! But the more I watched, the more I questioned how he could be THAT fast. I soon found out he was CHEATING! Grrrrr!!! Anyway, now we PROVE IT!! **Side note: I brought these games home this summer, and one day after dinner decided to pull out with my family. My son and his wife, and my 18 year-old son played these games for over thirty minutes. These are truly addictive!! I hope that this helps others as much as it has helped us the past two years. We've found different ways to use all of the products, and if you end up using, I would love to hear how it works in your classroom.